In Sydney, and perhaps even Australia, there is no pub more steeped in history than the Lord Nelson Brewery Hotel. Standing at the tip of Argyle Street in the The Rocks for almost two centuries, it has seen generations of Sydneysiders walk through its doors. It’s Sydney’s oldest continually licensed hotel and Australia’s oldest brewpub, celebrating special anniversaries of both this year. Sydney’s historic Rocks district gets its name from the Sydney sandstone used to construct buildings for the colony’s early settlers. The majority of these were convicts, arriving in Sydney Cove as early as 1788 aboard the First Fleet. Much of the sandstone was quarried from nearby areas by their hand and used for hundreds of buildings, few of which survive today. The building that is now the Lord Nelson was constructed in 1836 as the private residence of ex-convict turned publican William Wells. It was made predominantly using sandstone from the base of nearby Observatory Hill. That same material was also used for other iconic structures including (the never completed) Fort Philip, built primarily in response to the convict rebellion at Castle Hill in 1804. In 1841, Wells bought a liquor license for his residence, converting it in to a public house by adding two more stories and re-christening it with the same name as Britain’s most heroic naval figure. The license has never failed to be renewed since and the pub still stands in its original location. Upon acquisition of the pub by Managing Director Blair Hayden in 1986, a brewery was installed and began to produce highly-drinkable, unpasteurised and unfiltered English-style ales, no doubt inspired by the pub’s name. This provided a stark contrast to the light lagers dominating the beer market at the time. 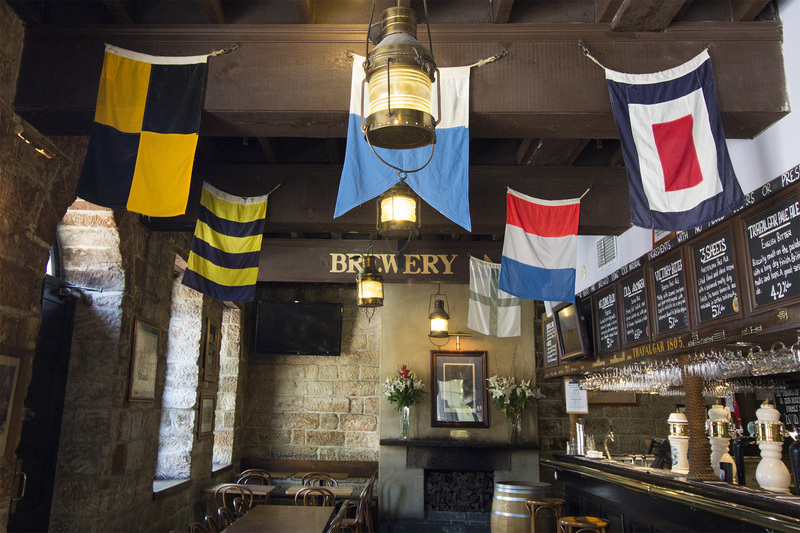 The pub was decked out with a distinct British naval feel, complete with nautical flags, rope and painted dates of historic Royal Navy victories (such as Copenhagen 1801 and Trafalgar 1805), a perfect setting for the English ales. To begin with, four beers were produced, including the biscuity Trafalgar Pale Ale, made with English hops and malt, Victory Bitter, in traditional bitter style, Old Admiral, a full-bodied old ale and Nelsons Blood, a smooth porter with notes of chocolate and coffee. In 1989, soon after the brewery’s installation, the Lord Nelson was visited by 44th Vice President of the United States, Dan Quayle. He enjoyed the Lord’s summer wheat ale so much they decided to name it after him, a move that resulted in global publicity. Quayle Ale, as it’s now known, was later joined by the flagship (if you’ll excuse the pun) Three Sheets. That’s not without an interesting story of its own – it was chosen by patrons as part of a naming competition and refers to an analogous phrase for drunkenness, “three sheets to the wind.” Together, these five brews are now part of the core, or mainstay, range, often joined by a number of limited releases. As the pub and its patronage grew, the space available for brewing shrunk. Nowadays, the operation is not unlike a small ship in both size and efficiency – something Lord Nelson would surely be proud of. Head Brewer Andrew Robson maneuvers beer from the mash tun in the cellar, to 640 L wood-jacketed fermenters on ground level, then back again for maturation, all whilst keeping track of which brew is in one of those four fermenters, six bright tanks and nine maturation tanks (from which the beers pour directly). Due to the limited space, the two bottled releases – Three Sheets and Old Admiral – are brewed and packaged off-site, a fact the Lord Nelson has never shyed from. This has been the case since the bottles were first released in 2006, featuring bright labels adorned with a modified version of the British coat of arms, Lord Nelson himself and a semaphore signal reading “VICTORY”. In 2016, the pub celebrated two historical milestones – 175 years of establishment and 30 years of brewing. Among the many celebrations were the bottling of the 175th Anniversary brew Dead Ahead, as well as the release of two cans – one old, one new. Quayle Ale represented the past, while the future was signified with a brand new beer, Backburner IPA, brewed with wit yeast, Curacao orange and coriander – flavoursome yet staying true to the sessionability and drinkability the Lord Nelson has become famous for. As a ship stays its course, so too shall the Lord Nelson as it navigates the ever swelling waters of the Sydney craft beer scene. Not only shall it forever hold a place in history, but will also undoubtedly continue its masterful reign as Sydney’s finest traditional brewpub. Here’s hoping those sights stay Dead Ahead – and cheers to 175 years more!